Fall is in full swing; the cold, dreary weather has set in for many of us and during this time of year sending flowers is the perfect way to brighten a birthday. The November birth flower is the chrysanthemum, and I am always reminded of the bright summer sun when looking at this flower. The name Chrysanthemum, in Greek, means “golden flower” as chrysanthemums in ancient times were mostly yellow. 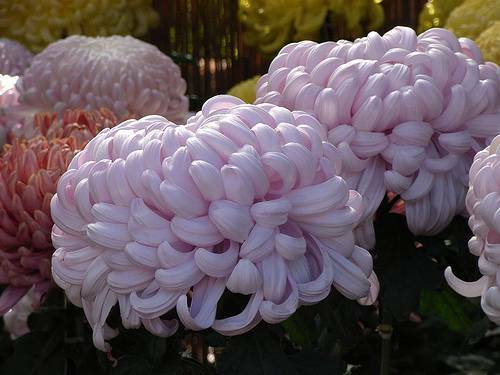 The meaning of the chrysanthemum is “with love and cheerfulness”. In the Victorian language of flowers, sending someone a chrysanthemum sends the message “you are a good friend”; how perfect all of these meanings are for a birthday? 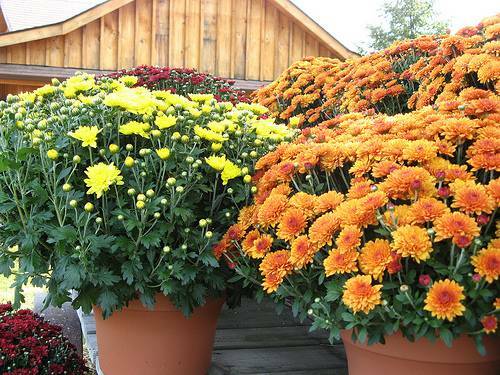 The chrysanthemum, or mum, is synonymous with fall, largely because it is one of the few fall blooming flowers. I imagine this is why it was chosen as the November birth flower. It also comes in fall colors of creams, yellows, oranges, purples, and dark reds, although it comes in white and pink as well. This November flower is actually made up of a great number of tiny, separate flowers called florets. The center disc is made up of short, small florets tightly clustered together and is surrounded by long ray florets. The central disc is not always obvious. There are many different forms of chrysanthemum flowers, such as anemone, pom pom, spider, quill, spoon, single, reflex, and incurved. The flower forms can differ from one another so much that sometimes they look like completely different flowers; I especially love the incurved flower form, which is featured widely in traditional Chinese art. The first chrysanthemums were most likely similar to small daisies, or asters. Chrysanthemums are native to Asia and Northern Europe; they have been propagated in China for thousands of years, and are still cherished there today. The flower was written about by Confucius in 500 B.C. and is depicted in Chinese pottery and artwork. From China, chrysanthemums spread to Korea, and from Korea to Japan in 386 A.D. Chrysanthemums made their way to Holland in 1688 and soon appeared all over Europe. They were widely bred and grown in Europe by the 19th century. They most likely came to the United States during the colonial period and by 1829 there were 17 varieties in this country. 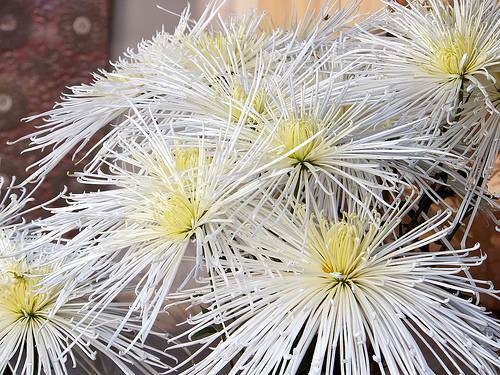 The mum is one of the most commonly grown flowers, with thousands of varieties grown for use as cut flowers, houseplants, and landscape plants. The birth flowers for November have had a long journey, and I am glad that they have made it to many gardens! 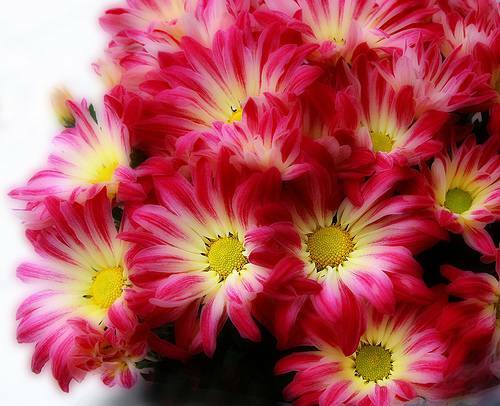 There are two types of mums commonly available-florist mums and garden mums. Florist mums lack an advanced root system and are easily killed by cold temperatures. They are grown in greenhouses and used often for cut flowers. They come in many stunning forms, such as the spider form and the quill form. I love making arrangements with these delicate beauties; however, if planting a pot outside in the summer, know that they will die when the cold temperature comes. I really love garden mums. The birth flowers for November provide color and cheer when everything else is dying, and there are so many different forms of mums that it can look like you are growing daisies, asters, and zinnias just by selecting different forms of this single flower. Garden mums, also called hardy mums, are perennials with advanced root systems that can usually withstand winter. This November flower is easy to care for. To grow mums in your garden, make sure to select a hardy mum. Plant chrysanthemums in well-drained soil that gets full sun. If possible, plant them away from street lights and night lights, as they bloom in response to short days and long nights. Light at night can inhibit flower development. Mulch plants after the ground has frozen, usually in the middle of November, for winter protection. They can be planted in containers as well. I pinch mums back in the spring and divide them every few years to keep plants healthy and thriving. In China, the mum was thought to have the power of life. The roots were used to cure a wide variety of ailments, petals and sprouts were eaten in salads, and teas were made from the flowers and leaves. In fact, chrysanthemum tea is still a very popular drink in many Asian countries today. I have tried it, and it is quite good with honey. Mums are still used in herbal medicine. Pyrethrins, made from crushed mum flowers, are used to make insecticides today. There are many legends about the November birthday flower. One of which tells of a Chinese emperor from 3,000 years ago who was searching for a magical plant that would make him young again. It was said to be on the islands of present day Japan. Only the young could harvest this plant, so he sent a group of youths to the island. They made it to their destination despite many dangers along the way, but they did not find the plant or any people. They decided to stay on the islands and cherished the Chrysanthemums that they had brought to trade as a link to their homeland. Today, in Japan National Chrysanthemum Day honors the mum, and it is the seal of the Imperial Family of Japan. In Asian culture, the flower means long life, prosperity, happiness, and a life of ease.